You can rely on Bonney Plumbing for all of your toilet repair, replacement and installation needs. We handle all of your residential and commercial plumbing needs, from high-efficiency toilets and bidets to commercial urinals. We are experts on High Efficiency and Eco toilets for water conservation too! Bonney Plumbing is the place to call for prompt service on your leaking, clogged or broken toilet. We provide same-day, full-service professional plumbing installation of new toilets, urinals, bidets and bidet seats. When problems require replacing your old toilet with a new one, our plumbers can handle it on the spot. At Bonney Plumbing, we highly recommend quality Kohler and Toto brands and we carry replacement toilets on our service vehicles to eliminate the need for a follow-up service call. Rebates are available! Most water districts have rebates available when you replace an old, inefficient toilet with a new, high-efficiency, low water consumption model. Contact your water district for rebate details and instructions. At Bonney Plumbing, we feature high-efficiency, low water consumption toilets in a wide range of styles from quality brands such as Toto, Kohler, Sloan and many others. 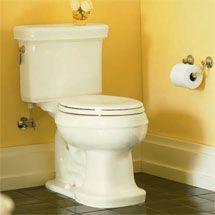 Single flush High Efficiency Toilets (HETs) use 1.28 gallons per flush. The latest dual flush HET offered by Bonney will use an average of 1.1 gallons per flush. Today, most water districts still offer High Efficiency rebate programs to homeowners and businesses. Ask your local water district about rebates available to help you replace your old, inefficient for a new, high-efficiency model.